The Do-days of September are no joke. Over the years things usually calm down following Labor Day, but this season proves that we can’t base anything on history. A couple of birthday parties arriving early and “BLAM” we have a party poppin’ off from the get go. We had a bunch of good friends, as well as a hip hop legend come through and rock out on the decks with us this past week. Haycock handed over the early control to Don Guapo visiting us from the Bay. Glenn Red, a veteran since year one joined us for the first time ever next. Sabo, who has many a Do-Over under his belt, added some crazy cumbia / moomba styles as it got more and more sweaty. The one and only Prince Paul showed up and showed us how to work some drops. He is the king of the skit in our opinion, so why not. NYC’s DJ Ayres rubbed it up and down as the sun tucked away. Lastly but never leastly, Valida closed it off in always beautiful fashion (sorry the recorder mysteriously stopped 13 minutes into your set girl). I guess folks should have been there. This upcoming Sunday we run The Do-Over in 2 locations at the same time once again. Portland will be jumpin’, L.A. will be crushin’. If we were tech savvy we would link them up via the interwebz with cameras, but we aren’t. Labor-Over? Ha, the rebranding of The Do-Over for special occasions has become an infatuation of late. How many “-over” things have been coined? Too many perhaps. 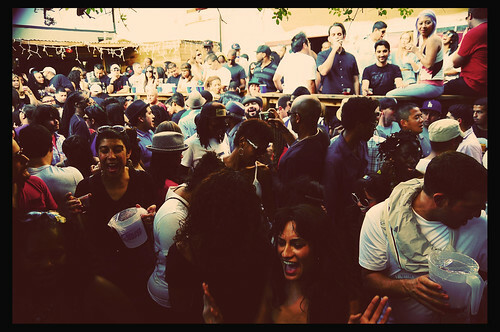 This past Labor Day Sunday festivities were definitive of what The Do-Over is all about. Our favorite friends, great crowd, amazing DJ sets, and lots and lots of drinking thanks to the extra encouragement of the holiday on Monday. We don’t hate holiday Mondays one bit! Kickin’ it off, Mr. Strong handled the two plus opening hours while the shade was the VIP. All the way from Bristol, via Columbia, Ethiopia and so many points between, Quantic provided some next level sounds that were pushing the future and the past all at once. Looking around seeing seasoned DJ’s with hands in the air is something else. One of the coolest dudes from the Bay, J-Boogie, came swinging for the fences and kept it extra sweaty. From NYC, The Rub’s own Eleven was next up and he set the party on fire. Finally, our annual regular from the very very north of Europe, Finland to be exact, Anonymous schooled us all once again. 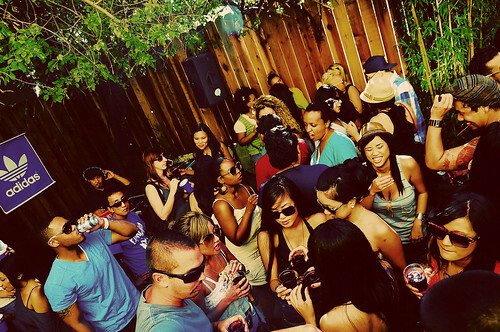 In true Labor day fashion, the party seemed to tick right along in various places throughout LA even after we closed, but some things are better left unmentioned. Oh oh, here we go again. The Do-Over Portland aka The Do-ORver aka The Do-Oregon closes out the summer series at Produce Row Café to bring the sunny slippery sangria fueled backyard boogie down before the rains come just in time to wash away all the spills. If you happened to be in attendance for Episode One or Episode Two, you might assume you know what to expect. However, we are bringing it even bigger and bolder this time around with two very special guest DJ’s to add to a few good locals. Don’t forget The Do-Over crew will be joining the festivities, bringing some special sounds as always. Just take our word for it and don’t miss out. *please note: if you RSVP’d for the previous two episodes, you are still RSVP’d. That’s how confident we are. Nice to have a true hot August Sunday on us to reassure us we are in LA and summer isn’t over. You know it just gets spicier as we roll into September and October? Well, that’s our prediction and we are standing by it. Helping to ease into the sangria spills, Haycock kicked things off in the sweaty sun handing it off to our good pal Rareform. Jerome Baker from D.C. followed up as the shade started to kick in. Next-up, the man too many talents to list, Bobbito, travelled from NYC with a special box of 45’s. DJ Day took it into the night with an extremely heavy set, many giving it the thumbs up for the season. Closing it down, in honor of MJ’s birthday, Peanut Butter Wolf dropped a special VIDEO tribute set and lit the backyard up.